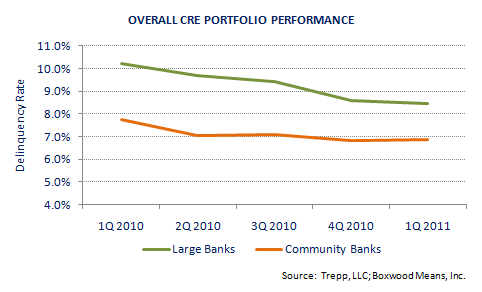 Boxwood Means | CRE Exposure Hinders Community Bank Lending - But Not Big Banks? 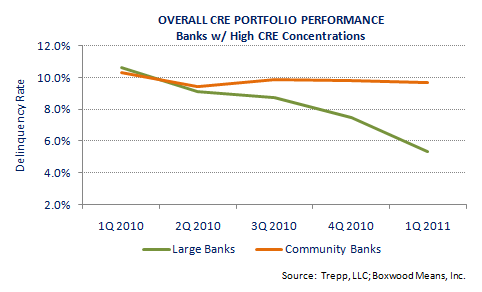 CRE Exposure Hinders Community Bank Lending - But Not Big Banks? As investors in small-cap properties know all too well these days, a lot of community bankers around the country that had been active in CRE lending before the Great Recession continue struggling mightily with exposure to distress-plagued (and mostly small-balance-heavy) commercial mortgage portfolios. The primary strategy to be employed by the operation known as BH Capital LLC is to purchase pools mostly of small-balance recourse commercial mortgages as well as commercial/industrial loans from community banks and smallish regional banks around the country. While the BH Capital team has extensive experience investing in and managing property-secured debt, it isn't looking to own collateral securing the loans it's targeting through modest-sized investment funds, explains CEO Michael B. McKinney. Rather the aim is to buy opportunistically, collect whatever debt-service revenue may be forthcoming and, where necessary, restructure payment plans or negotiate discounted payoffs with borrowers whose personal assets are on the line, McKinney adds. Where foreclosures become inevitable, collateral properties will be sold to other investors. The group is deliberately targeting loans with unpaid balances in seven-figure territory - as a means of avoiding the crowded space competing for the $10 million-and-up assets. As McKinney explains, far fewer large-scale investors are committed long-term to the "more fragmented" and "less efficient" small-balance space, presenting a savvy, multi-disciplinary group with more lucrative opportunities. McKinney and colleagues are anticipating that many banks around the country will be looking to shed under-performing CRE and C&I loans in coming months, as they return to financial health and can pursue such dispositions while avoiding impairment of capital ratios. The thinking is that many of the loans to be acquired will be a couple-three years into five-year terms, with some of them technically in default due to falling collateral values while still current on payments. And when the FDIC offers interests in small-balance-heavy portfolios of loans it inherits from failed institutions, the BH Capital team will likewise look to form solid entities to bid on them. Even though it's likely that 60 to 65 percent (by dollar balance) of the loans BH-managed vehicles acquire will be performing, the brain trust aims to squeeze internal rates of return in the 15 to 20 percent range on an unleveraged basis, McKinney specifies. It's possible management will look to leverage some of the funds perhaps 40 to 50 percent - if it appears likely to goose the equity return rate. The new group hasn't formally raised any capital yet, but anticipates being active in all categories of income properties all across the country. Logically the team aims to scour certain states heavy on unresolved distressed assets: California, Nevada, Arizona, Georgia and Florida. The aim is to form a series of investment vehicles, with the earliest likely capitalized with $25 million to $35 million in equity commitments from a wide variety of investors. Fund duration expectations would mostly be in the five-year range, with further extensions allowed if appropriate. McKinney and his five partners (Randy Hughes, Paul Jankovsky, Jr., Daryl Bird, Kevin A. DeLozier, Bryan Crow) have considerable expertise in commercial mortgage acquisitions, asset/portfolio management and loan servicing. They were attracted to Behringer Harvard's renowned network of capital-raising professionals and quickly found that their respective team assets were "a natural fit," as McKinney puts it.